YPSILANTI is an embryo transplant son of BIG SKY TRITON out of one of our most prolific donor dams, WJM NADINE 145N. He is a thick-made, attractive, sound structured and eye-catching bull who nicely balances moderate birth weight with strong performance and maternal strength. His dam was selected for our ET program because of her capacity, fleshing ability, sound udder and productivity. 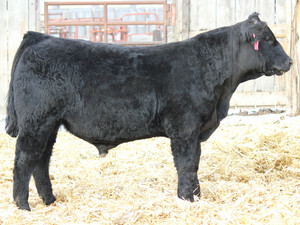 YPSILANTI is one of 5 son of NADINE selling in Performance Power 2012, including two full brothers and two maternal brothers sired by MAC UNION STATION 87S.